I admit shopping with me is fairly grueling. I make snooty faces when I walk into stores, I ask a lot of questions to the salespeople, and usually walk out empty-handed. Although I claim I have a honed sense of style, I usually only know what I like when I see it. Which is exactly what happened with this couch (do you say couch or sofa? I say couch). It was Saturday…our very looong Saturday shopping for furniture. Williams and Kay was our last stop in the way of actual furniture stores. We had left Ashley Furniture pretty early due to the fact Ethan could see it on my face that we weren’t going to find anything worthy there. As we ambled into the under construction store (major concrete resurfacing, people), I thought the quality was nice and no one was hovering. All the dining room sets were too large, so we moved to the back where the living room sets were staged. I remember walking down the stairs and seeing this couch, pot lights shining down on it like heaven’s rays. I zigzagged around the other pieces and took a seat. The look is spot on. In my head I wanted a navy couch and white piping with in a traditional shape. But this dusty sea-foam with beige piping complements our new rug almost perfectly! I like the cushion-y back and basic legs…and those little arms are begging for some mismatched pillows. Now for the feel. Have you ever sat on a couch and it crunched beneath you? I’m not talking one that has a clear cover over it like distant older relatives have in their front parlors. I’m talking the filling and construction actually created a crunching noise. At a decently ritzy home store in KC I had the displeasure of sitting on crunching couches over and over again. Such a disappointment! But this baby sure doesn’t crunch. The cushions allow you to sink in a little, but also has some firmness to keep from sucking you in completely. Ethan slouched down in the funniest position to see if he could get comfortable in it. And he did. Now that it’s in our living room, I’m a little afraid to sit on it (and certainly afraid to let Simon). I’ve never spent this kind of money before, and I don’t want to put wear on it so soon! But I’m sure the feeling will pass by the end of the week…I mean, how could I not sit on it?! How do you think it looks? Is it a smart and classic choice? I think it is beautiful and it belongs with the persian rug. It’s like nothing else would have been right for it. They belong together!!! I can’t wait to see your other purchases as you go! Love Yas! 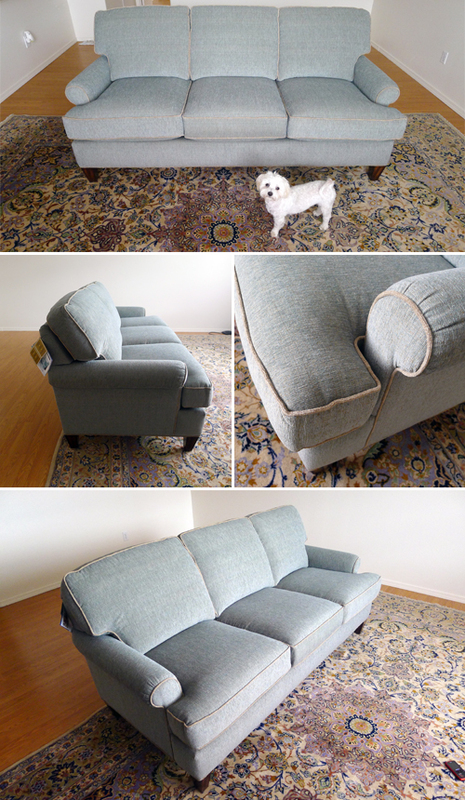 My goodness, it’s gorgeous–and the Persian rug is truly perfect with it!